Just because someone is a vegetarian doesn’t mean they don’t love a good BBQ. Because what’s not to love about eating and drinking outside with your friends on a delightful summer day? Yet, BBQs are often not too kind to vegetarians, with their heavy focus on meat. But this summer, you may want to incorporate some vegetarian recipes for your BBQ to accommodate your veggie friends and family. In 2016, CNN reported that 87 percent of people plan to grill this summer, which means there’s a good chance you’re storing away a recipe or two. But we also know that, when it comes to hosting a party, it’s sometimes stressful to cater to every guest’s dietary needs. Yet, a little goes a long way when it comes to making an effort to ensure your vegetarian (and vegan!) loved ones feel included. Because while people who don’t eat meat can usually enjoy party staples like salads, chips, and fruit, they’ll feel even more appreciated if you grill them up something special! To help you please the vegetarians in your life, here are 11 recipes to consider for your summer BBQs. And we’re pretty certain meat eaters will want to try these yummy foods too. These spicy black bean burgers with tomato salsa from A Modern Rose are perfect to serve, because what’s a BBQ without a burger? 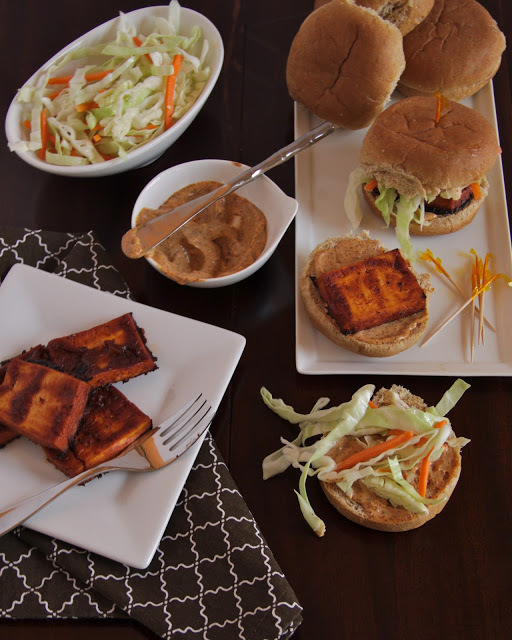 This recipe for barbecue tofu sliders with coleslaw and chipotle mayo from Climbing Grier Mountain has you baking the tofu, but you could always throw it on the grill because no matter how you prepare it, your vegetarian friends will be feeling the BBQ vibes. Skip the chicken with these cauliflower “wings” from Vegan Food Videos that you can make in barbecue, buffalo, and salt and vinegar flavors. 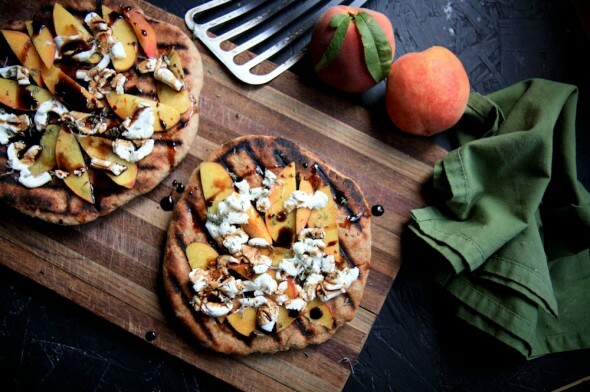 If you have fresh peaches in your area, then this grilled peach and goat cheese pizza recipe with thyme and a balsamic-honey sauce from food blogger Wholefully is a must. A grilled romaine Caesar salad, like this one from Rawcology, is super easy to make and super tasty. 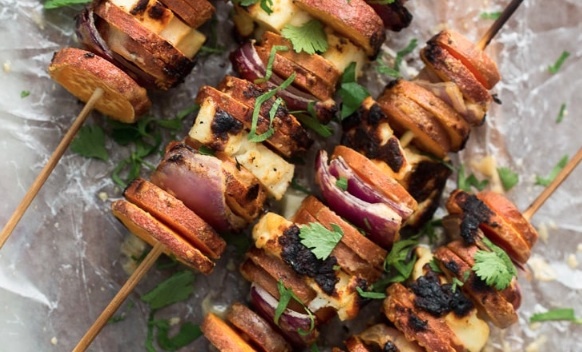 We’ve all had sweet potato fries, but how many people have had sweet potato skewers? 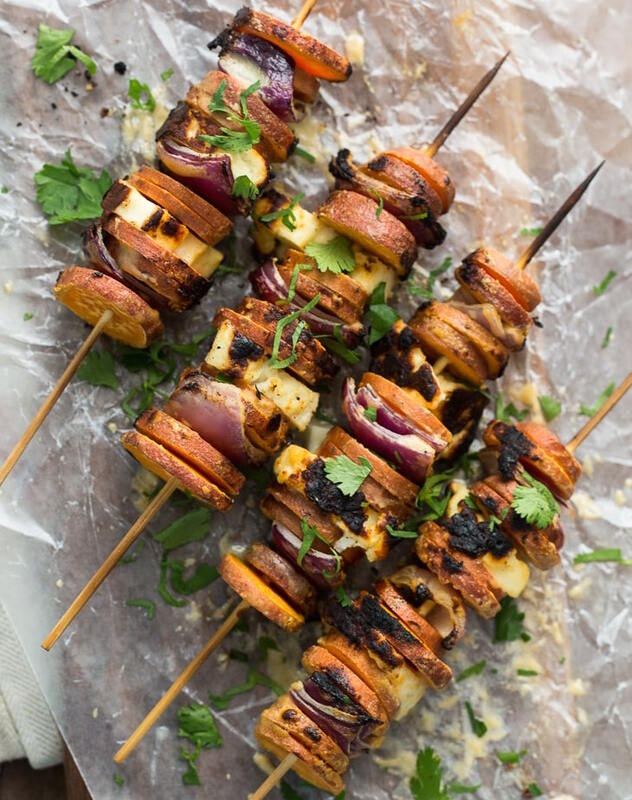 Prepare these grilled sriracha tahini sweet potato skewers with halloumi from Naturally Ella in advance and then prepare for your guests to be wowed. These cheesy stuffed mushrooms grilled on a cedar plank from A Farmgirl’s Dabbles are a great appetizer for all the cheese lovers at your party. Grill up some eggplant, zucchini, and peppers and combine those yummy veggies with tomatoes. Put them on top of delicious bread for these grilled ratatouille tartines from Love & Lemons that are different than your standard bruschetta. 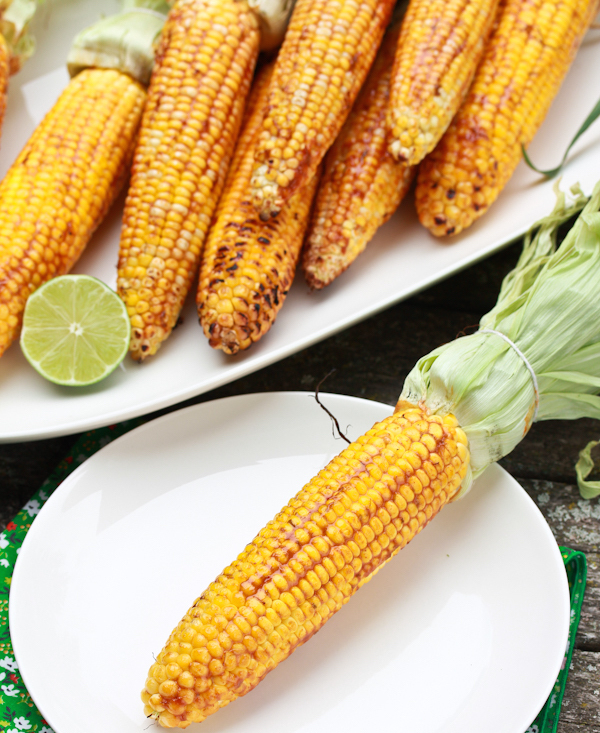 Corn on the cob is a necessity for a BBQ and this grilled corn with smokey lime mayo from A Spicy Perspective adds a kick to this traditional recipe. This recipe — featuring asparagus, bell pepper, and melted cheese — from Wholefully makes for an alternative sandwich selection. A quirky way to have your vegetarian friends feel included is to serve bananas in hot dog buns. While most banana hot dogs are usually served with sweet sides, the above Instagram post from Aksella’s Diary shows you can still make them savory. No matter what veggie dishes you serve this summer, your vegetarian guests are sure to be thrilled with any of these grilled treats.